At a time when an emerging democracy like Indonesia can appoint eight female members to its Cabinet, and when disenchanted young Australians are electing to fight on behalf of foreign causes, a more inclusive parliament will strengthen Australian democracy. It is perhaps the most profound symbol that can illuminate our commitment to social cohesion. 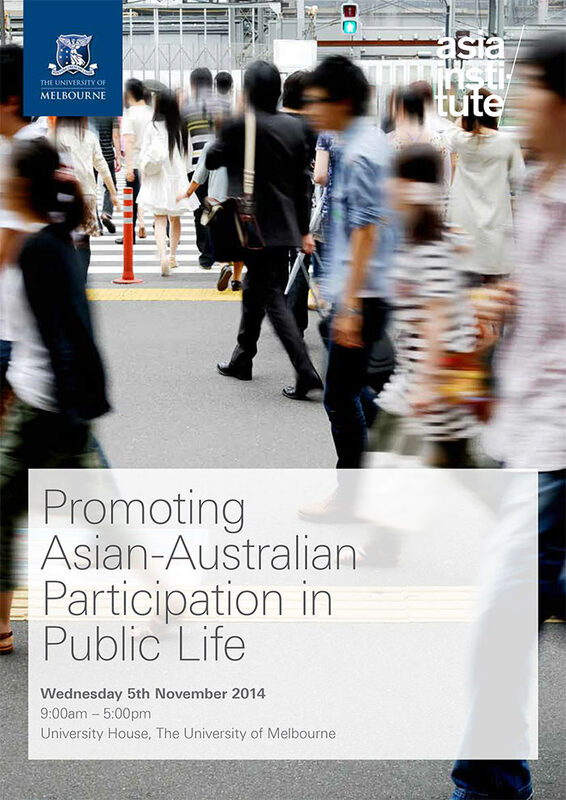 This week the University of Melbourne’s Asia Institute is hosting a symposium for prominent Australians, policy makers, community activists and scholars to come together to explore the dearth of Asian-Australians in a range of areas of public life, with a specific focus on politics. As a co-chair for one of these session, I would like to contend that more conversations such as this are sorely needed. Undoubtedly, it is important to acknowledge that in 2011 2.4 million people in Australia identified as having Asian ancestry, and that aside from a smattering of elected representatives, Asian-Australians are nowhere to be seen. However, it is equally important to highlight that the tenets of this debate are not based on an assumption that Asian-Australians are more deserving than any other Australian community as the subject of political or cultural inclusion. The reality is that Asian-Australian is a label that allows groups of ethnic Australians to look beyond our own ethnocentricity and focus on a range of cultural issues that bind us together because of our particular relationship with the Australian public. Use of the term in fact references deep-seated racial assumptions about ‘Asians’ that have been handed down in Australia over generations, such as the legislative exclusion of ‘Asiatics’ in the Immigration Restriction Act 1901, or the way the phrase has been used to create racial conflagrations during the Geoffrey Blainey affair in the mid 80s or the rise of the One Nation Party. In 2014, numerous incidents have set the tone about the paucity of ethnic and religious diversity in various areas of Australian public life. Sydney journalist and producer Mohamed Taha commented on a lack of diversity amongst Australia’s public broadcasters. The release of the Diversity Council of Australia’s Cracking the Cultural Ceiling report highlighted that in the world of business, only 4.9% of senior executives come from Asian backgrounds. But there is something peculiar and profoundly important about politics. It is also in part because the western democratic tradition is built on the centrality of politics to the integrity of the nation – consider that the ancient Greeks described a contribution to the political realm as commensurable with the ‘good life’. The argument for a more culturally and religiously diverse parliament can come from a lot of places. Some of them are ultimately misplaced. The least convincing is the idea that you need a diverse parliament to ensure that there is a proper representation of specific groups. It is a mistake to assume that a person of a particular ethnic background is more qualified to represent a cultural group than another on the basis of how they look or what they speak. But this failed argument does not detract from legitimate and more pressing reasons. Take for instance, Dr Sonia Palmieri who considered that the ‘gender mainstreaming’ of Australian parliaments can offer a positive example to society at large. A more diverse parliament along lines that includes gender, ethnicity and religion provides the opportunity for young Australians to imagine a different future for a whole range of intersectional domains of structural disadvantage. We should remember that political participation is one of the only tangible ways Australians can express their citizenship. Freedom of expression, association, privacy are tenuous compared to our ability to participate in the political process which is one of the few rights that are enshrined by the Australian constitution. Certainly, there appears to be no problem with the ability to enter political office on the basis of being a migrant. We need look no further than our last two Prime Ministers, Tony Abbott and Julia Gillard, who were both born in Great Britain. As unpopular as it may be to admit, 2014 has reinforced that racial thinking is alive and well in the Australian polity. These kinds of values and belief systems impact upon people in very direct ways, such as in the segregation of public space (Federal parliament for a couple of weeks), and such as through physical attacks. But the most insidious expressions of racism is where it plays a role in shaping or diverting a person’s longer-term life opportunities. It is one thing to avoid facing racism in public debate because those in positions of responsibility find it too hard to explain or contain. It is another thing to ignore or admonish the effects of structural racism when it leads to a divided and segmented society. Ultimately, Asian-Australians share with all Australians the dilemma that we live in a time of global mobility, that Australia is one of the most diverse and successful liberal democracies in the world, but that we have to find ways to sustain social cohesion, and to make sure that the different people who make up this nation have a stake. If it can happen in the corridors of power, we will know it can happen in Australian society at large. Jen is co-chairing a panel with Asian-Australian candidates from the upcoming Victorian state election at the University of Melbourne’s symposium Promoting Asian-Australian Participation in Public Life.